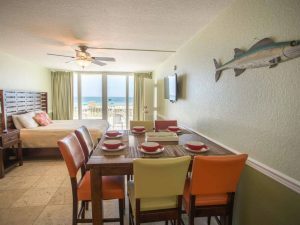 Stay at one of the only two bedroom suites at the Island Inn Resort. This large beachfront condo joins two separate staterooms into one single space. The entire condo has been recently remodeled with all new furniture and bedding, and is fully updated with everything you’ll need. This special room combination makes for an outstanding family vacation spot, or a spacious room for two. Staying here gives you two of the premier Island Inn Studios, with two private beachfront balconies, two full bathrooms, and a comfortable living room area with big screen TV. There’s absolutely nothing else like it at the resort!